Video telephony applications are being widely used in our day to day lives and the demand for better quality keeps growing. The proliferation of Video Chat or Video Conferencing equipment and services offered to consumers and enterprises is indicative of this shift. And consequently, service providers require too ensure the video quality delivered meets customer expectations. This requires next generation test tools that provide video analysis to gauge the quality, bulk video call generation capability to stress test network, and end-to-end video test tools to perform tests on multiple devices and networks. GL's Video Quality Testing Solution comprises of end-to-end Video Conference testing, using VQuad™ with Video Application Controller (VAC), providing both Video and Voice MOS between two VAC Agents (one end could be an Android device). GL’s VQuad™ solution provides an automated method to test Voice and Data from any mobile device. With the introduction of GL’s VAC™, Video Conference test capability is added to the overall solution. GL’s VQuad™ with VAC solution supports end-to-end Video Conference testing between any two VAC agents, with support for variety of video codec - H261, H263, H263+, H264, MPEG VIDEO, MPEG 4, MPEG 2 , and VC1. Agents can be Linux, Windows® or Android devices. In other words, test Video Conferencing between an Android phone and a Windows® PC. The VQuad™ with VAC solution is fully automated using VQuad™ scripting for testing a variety of scenarios with access to all video parameters such as Codec, Frame Rate, GOP Structure and Image Size. For more details, please visit Video Application Controller (VAC) webpage. GL’s MAPS™ SIP provides a means for Bulk Video Call generation, simulating many Video Calls from a single MAPS™ SIP system. As part of this solution the GL’s PacketScan™ can provide real-time Video Call Analysis of the video generated over the SIP call using a non-intrusive connection to the network. GL's MAPS™ SIP with Video Calls option is a bulk SIP call generator which can simulate any interface within a SIP network including multiple User Agents. As a new enhancement, the RTP Video Traffic Generation capability is now added to GL’s MAPS™ SIP Emulator. It can generate hundreds of concurrent video calls with codecs such as H.263, H.264 and VP8. 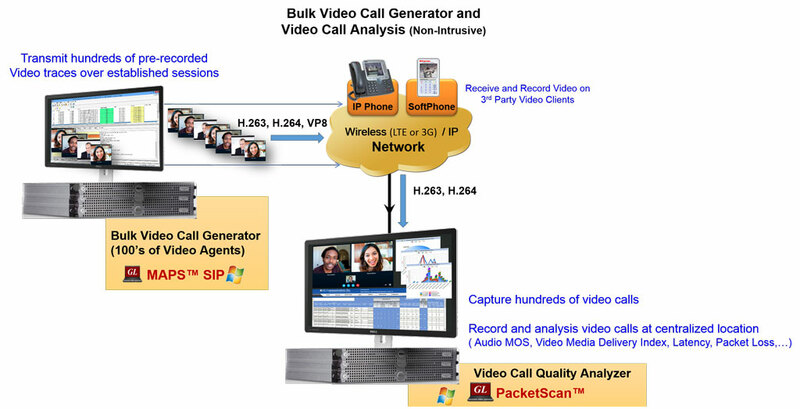 Bulk video call generation capability helps in conducting load and performance tests on devices or network under test. MAPS™ also supports transmission and detection of various RTP audio traffic entities for example: digits, voice file, single tone, dual tones and FAX. For more details, please visit MAPS™ SIP and Traffic Simulation webpages.